​Geoffrey Tozer's lifelong love of the music of Nikolai Medtner began in childhood, when his mother gave him a set of 78 rpm recordings of Medtner playing his three piano concertos in London in 1948. Tozer was drawn to the music for its haunting melodies and its complexity. He first performed Medtner's music in his youth in Melbourne. At the same time he began to collect rare published editions of Medtner scores, eventually accumulating the largest privately held collection of Medtner's music in the southern hemisphere. In 1991, he reached one of the pinnacles of his career when CHANDOS invited him to record the Complete Medtner Concertos with the London Philharmonic Orchestra. 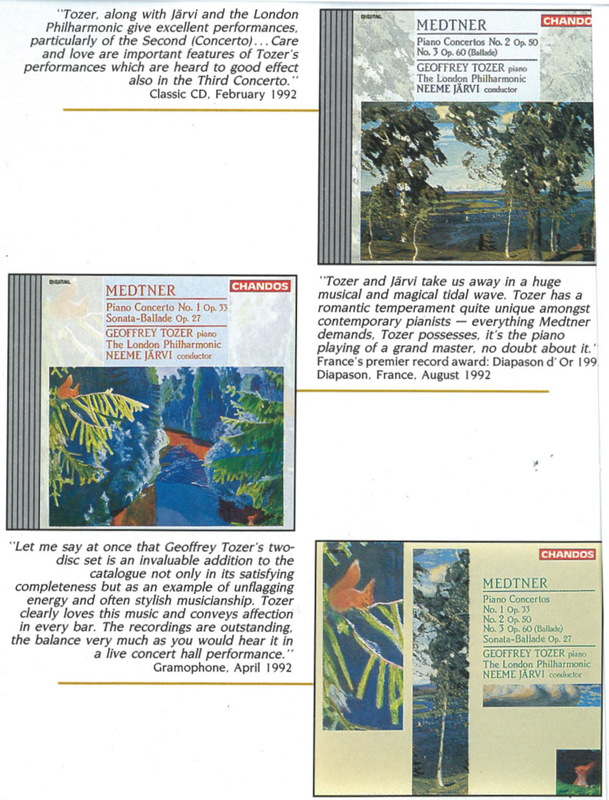 Tozer's complete recordings of the Medtner Concertos won him the Diapason d'Or and a Grammy nomination in the United States, making him the only Australian classical pianist ever to be nominated for Best Classical Performance. ​Tozer led the Medtner revival in the early 1990s and became the foremost champion of Medtner's music until his untimely death in 2009. In 1998, he wrote the Performance Notes and a Biography of Medtner for the Complete Sonatas of Medtner published by Dover in New York, USA. His recording of the Complete Medtner Sonatas, released by CHANDOS in a prestigious box-set edition, established an extraordinarily high yardstick by which other performers could be measured. by Peter Wyllie Johnston (Feature article about Tozer and Medtner) first published in The Melbourne Report, Volume 7 No.11, 1992, pp.31–32 and republished in From the Melburnian, 2011, Ellikon Publishing, Melbourne.